Sellers may be pressing hard, but XRP bulls are technically in control. Before we recommend longs, XRP prices must first race above 34 cents confirming bulls of Jan 30 and those of late Dec 2018. With supportive fundamentals, this trade plan is valid and likely to print out. That Brad Garlinghouse and Ripple honchos are ambitious is an understatement. Ripple executives are on a mission and to achieve their objective, they ought to have their presence felt in zones that remain largely un-banked. That is, areas where citizens yearn for financial services but they can’t just access them. Limitations either set by the banks or internal because they aren’t empowered. The Melinda Gates Foundation core objective is to empower these people and by leveraging Ripple solutions—xRapid, xCurrent or the Ripple Net, the underprivileged will access better services. Besides Mojaloop, Ripple is working hard by creating efficient, payment corridors especially in developing countries like SE Asia, Africa, and the Middle East saving SME and business people from the inconveniences of high costs and latency. It’s also going to be better now that Ripple is searching for local contacts in China. The introduction of cheap cross-border alternatives in a sprawling, industrialized economy like China means profitability and should liquidity solutions as xRapid find use, then XRP prices will surge. At second in the liquidity table, XRP prices are stable. While sellers have had the better of bulls in the last few days, buyers are technically in control. However, before we recommend XRP longs, we shall take a neutral stand knowing that technicals favor buyers. Note that in an effort versus result perspective, the simple fact that bears are struggling to reverse gains of Jan 30 hints of underlying demand and resistance of lower lows. As such, it is likely that XRP will find support in days to come. All the same, conservative traders should adopt a neutral stance until prices surge above Jan 30 highs or race above 34 cents—Jan 14 highs. Such a bullish move will automatically trigger risk-off traders into action as they aim for 40-42 cents. Jan 30 and 31 bull and bear bars stand out in our analysis. As a high volume, wide-ranging bull bar, it is significant for bulls and therefore anchors our trade plan. Like we have said, bulls will only be in charge if there is confirmation of Jan 30’s bull bar—49 million versus 17 million. Behind this confirming bar should be a high volume bar with volumes above 49 million of Jan 30-31 and even preferably above Jan 10’s 83 million. 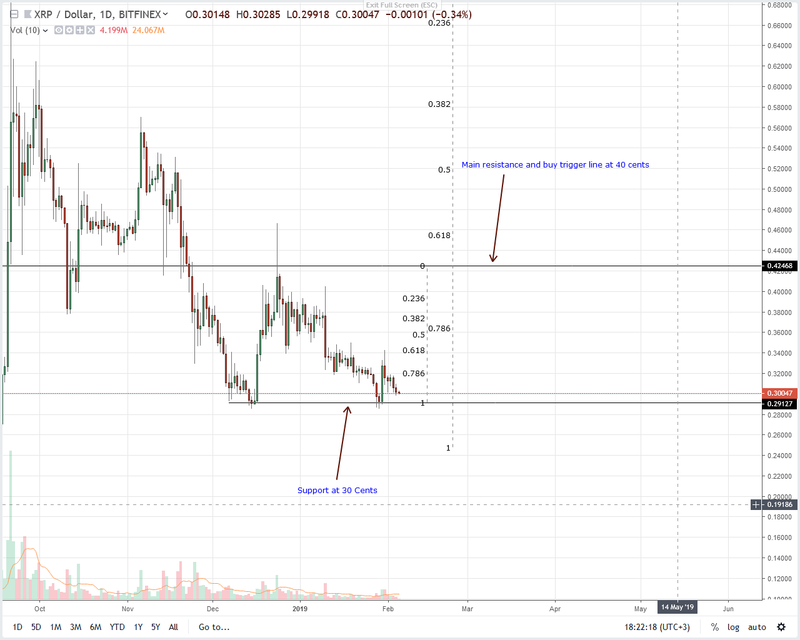 The post Ripple Price Analysis: XRP Stand to Benefit From ASEAN Adoption Drive appeared first on NewsBTC.